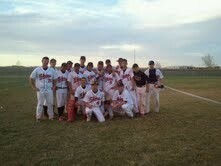 The Scott City baseball team swept the Liberal Redskins 6-1 and 10-7 Tuesday at Scott City. In game one, Tyson Deaton struck out 11 in the 6-1 loss. Jose Pando went 2-2. In game two, Freddy Gomez was 3-4 in the loss. Liberal is 3-6 and goes to Ulysses Monday.